After 5 years on Airbnb and 25 positive experiences, I was bound to come across a host I didn’t get along with. That day came this past March, when upon leaving the studio I rented in Paris for one month, the host bombarded me with a series of nasty messages saying I left her apartment the “dirtiest” she’s ever seen. Despite taking out all my trash before leaving, the host was pissed that she had to wash the sheets and towels and vacuum my hair from the floor. Now, I will say my hair is very long (waist-length) and so it does tend to pile up faster than the average person. But vacuuming and laundry are simply part of the job as an Airbnb host. I didn’t leave any sort of abnormal mess that would require extra or specialized cleaning. No spills, stains, broken items, nothing. I didn’t even cook while I was there. In any case, I realized right away that this host had an abnormally high expectation of cleanliness for her departing guests, and no amount of reasoning would calm her. I was notified by Airbnb that she wrote me a review the very next day. I knew it wouldn’t be good, and I had an important meeting that week, so I didn’t write a review of her apartment right away. The following day, I received a notification that the host made a claim on my security deposit for 100€. She wanted 80€ for a new sliding curtain, claiming I broke one of the 3 layers and 20€ for using “ALL the towels” in the apartment. After 5 years, no host has ever made a claim on my Airbnb deposit. I’ve never been accused of intentionally, nor accidentally, breaking something inside a host’s place. I’ve gotten constructive feedback, sure, but to go so far as to make a falsified claim on my deposit was a first for me. In case it’s not obvious: no I did not break her sliding curtain (it was broken the day I arrived). And no, I did not use all her towels. I washed and folded two of them before leaving, and the other two could easily be washed in one load. I began to frantically search for what to do in this scenario. To make matters worse, I had no photos or video of the apartment that I could use to exonerate myself. I have done this in the past as “insurance” but this particular day, I had an 8am flight, so I was rushing to leave and didn’t take any photos or video. I’d like to be clear that this post is not intended to help tenants avoid paying for things they broke. My intention with this post is to help others who have been falsely accused of breaking something by a disgruntled host rightfully exonerate themselves. If you did break something in your host’s place, then kindly offer to pay for it or just replace it while you’re there. The majority of (good) hosts will not expect you to pay for the item, as many are aware that things need to be replaced from time to time. In my case, I truly wasn’t responsible for her stuck sliding curtain, nor the fact that she had to do laundry between guests. 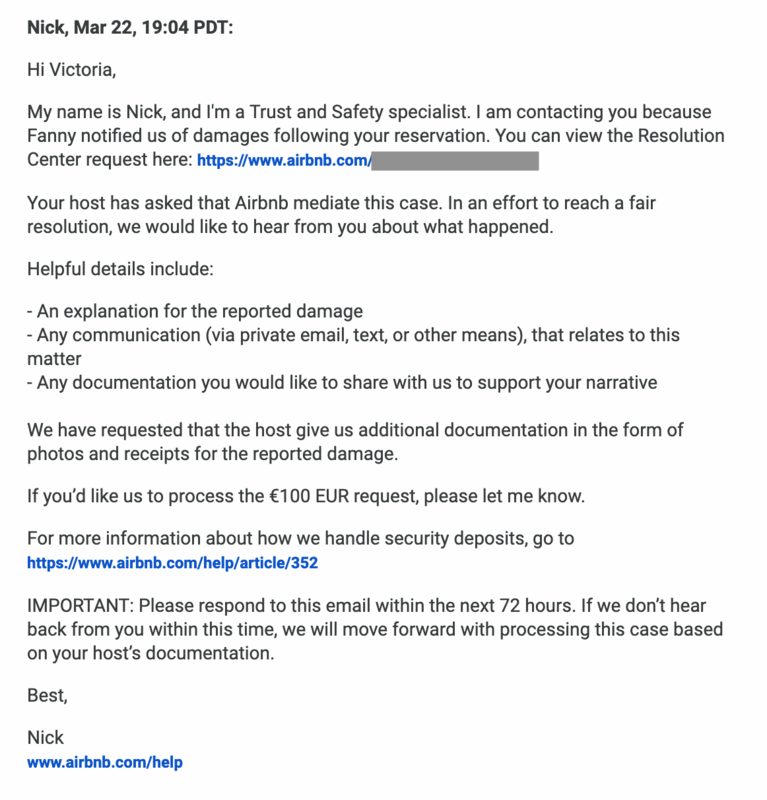 The way Airbnb disputes work is either party can create a claim with the Airbnb Resolution Center. The other party must respond within 3 days, otherwise the claim is processed as reported. The host actually has 60 days to make a claim on a deposit, but the earlier this is done, the better chance the host has of winning. If the other party denies to pay the claim, the complainer can then elect to involve a mediator at Airbnb. The mediator’s decision is final and cannot be appealed. Read over your host’s claim several times before responding. Read over their private messages to you and re-familiarize yourself with everything. In my first response to the host’s claim, I wrote a very simple message. Airbnb also allows you include a private message to the Airbnb Resolution Center team, in which I went into more detail. As expected, the host involved Airbnb in the request shortly after. At that point, I called Airbnb and asked what to expect. The customer service agent was very kind and told me not to worry. They reassured me that the host has to prove that I caused damage in order to be awarded the money. If I didn’t cause the damage, then I likely wouldn’t have to pay for it. They acknowledged that it doesn’t feel good to be accused of something you didn’t do and said things would likely work out for me. Late that night, I received a message from the Airbnb Resolution Center. As I mentioned, I had no photos of the apartment to support my case. I knew I had to use my words to convince the Airbnb mediator that I was innocent. From that point forward, I treated this situation just like a legal case brought against me. Even though I was the “defendant,” the burden of proof still lied with the “plaintiff” to prove my alleged wrongdoing. I was lucky that my host made overly emotional falsified claims that gave me a lot to work with in my defense. Lack of Photos: It helped me that the host included no photos of the actual damage to her apartment. 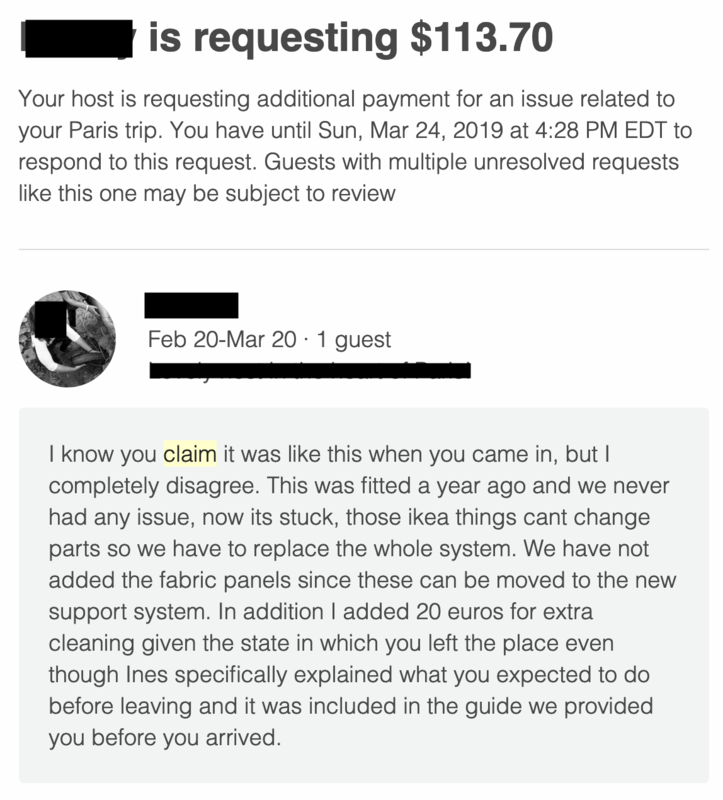 Airbnb gave her time to submit photos, but in the meantime, I used this to my advantage to prove that the host just wanted to charge a cleaning fee and was making up damages in order to get it. 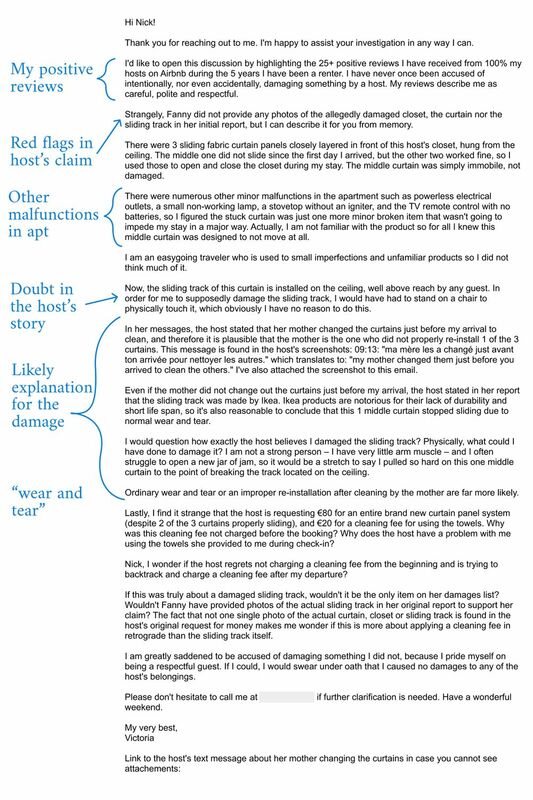 If the claim were truly about damages, there would be detailed photos and it would be the only item on her list. Cleaning Fee: The host’s addition of a cleaning fee on this claim did not help her case. According to Airbnb, you cannot charge a cleaning fee to a guest after they leave, unless it results in the damage to your property. Ordinary cleaning fees cannot be extracted from a security deposit. When she added a cleaning fee, it immediately lowers a host’s credibility for true damage to an apartment. No Receipts: The host did not include an original receipt for her curtain, nor a repair estimate. You cannot simply make up a number to charge someone, even if you found the same product online. The Mother’s Involvement: The host wrote text messages stating her mother changed out the curtains immediately before my arrival to clean them. It’s therefore reasonable to conclude that the mother did not properly reinstall the curtains, which explains why one did not work upon my arrival. Ikea: If a product is made by Ikea, the world’s least durable product maker, it’s reasonable to conclude that the sliding curtain broke on its own, as a result of “wear and tear.” I wouldn’t voluntarily offer this information if I were the host, but she did. Looking back, I probably went a little overboard in my detailed response, but I really had no idea what to expect. I did not hear back from Nick even after the three days had passed. I submitted a support request, and finally Nick wrote back saying he had received my response, and was still waiting on photos and documents from the host. I was frustrated by this, but let it go. About a week later, I received an email saying Airbnb was closing the dispute. I hope this post was helpful to you if you find yourself involved in an Airbnb dispute on either side. If you want to win a dispute, here is my advice. Take photos of everything before you leave, and make a video too if you can. This will help you against any claims. Report any damage you notice the day you arrive. Don’t assume the host is aware of it, like I did! Most hosts will apologize for things not working, and attempt to replace them, but some will apparently try to charge you for them! Of course, if you’re reading this article, it’s likely you’ve already found yourself in this predicament and it’s too late for that. So, my best tip is to use the phrase “ordinary wear and tear” in your defense. Airbnb rightfully does not hold guests responsible for items that break in a host’s residence, provided they broke due to normal wear and tear. I avoided making any extreme statements and made my words as non-emotional as possible. Again, my wish for this article is not to provide an escape route for damaging guests, but there are scenarios where hosts try to extract money from guests and my hope is that this guide will help you avoid extortion from unethical hosts. There are bad hosts and there are bad guests. I wish Airbnb rental expectations were standardized to avoid situations like this, but for now, it’s kind of a free for all. I personally am left with a sour taste in my mouth after this experience and will think twice before using Airbnb again. Have you won an Airbnb dispute against a host? Thank you for this information! My family and I have used AirB and B several times and have no issues. But it’s always wise to be careful and you pointed out several things to be aware of. So, thank you again and I love reading about your adventures!